When our Icelandic ancestors were faced with starving to death or risking their lives immigrating to North America, they had little idea of what they were getting into. An entire continent covered in endless forest. Just the size of North America was beyond comprehension. In place of valleys and mountains, there were days of traveling through dense forest. Winter, in Iceland, could be bitter, but not with the temperatures of the prairies. The immigration agents came. There were brochures. There even may have been some letters from people who left early. But nothing prepared them for what was to come. 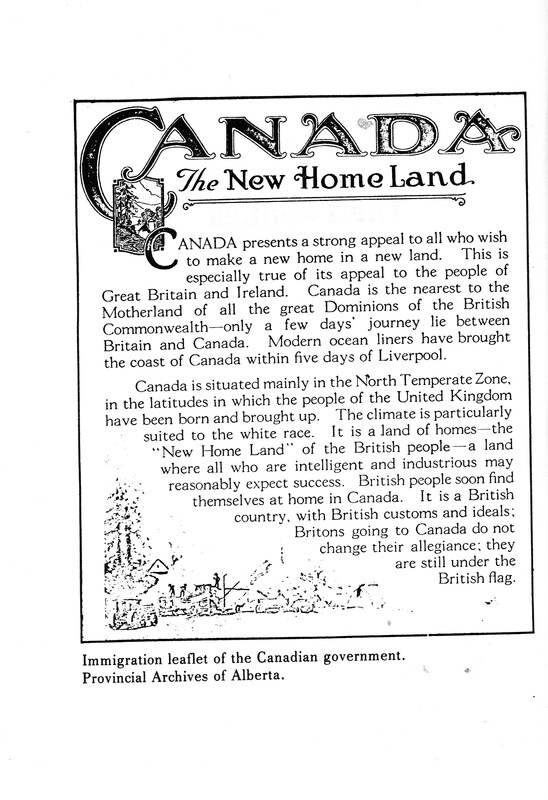 The Canadian government was not soliciting immigrants for the benefit of the immigrants. They wanted immigrants to produce goods and order goods that would be transported on the railways. Politicians and businessmen wanted immigrants because they could make money on them. There were no preparatory classes. No one said “We want immigrants to come to Canada. How can we help assure that they are successful?” No one bothered to look at the country of origin, learn about the immigrants and create a program to prepare them for what they would face. It would have taken very little to provide classes. Those could have been held in the harbours as the emigrants waited for their ships or they could have been held on the ships that went from Iceland to Scotland and from Scotland to Montreal. How intelligent did someone have to be to look at Iceland and say, “No trees. They live in rock and sod huts. We’d better have a class on cutting down trees, preparing the logs for building, chinking the logs. Using an axe. There are no large wild animals in Iceland. We’d better teach them to use rifles and shotguns and how to hunt and trap. How to fish. The kinds of nets to use. The best way to clear land. The preparation of Canadian food. All of this, and more, could have been done on board the ships. Local natives could have been hired for next to nothing to instruct the settlers how to best prepare for a winter in Canada. The result was that the situation of the Icelanders became so desperate that they had to have help for internal relocation. They were the only group to receive such help. That help came from the sheer good luck of having Lord Dufferin as a powerful friend in Ottawa. Even with that help, there were desperate times. What help and advice there was had to come from the Icelandic agents who helped recruit them. However, they did not have the resources to arrange for teachers on the ships who would over a period of two weeks or more teach the immigrants the basic skills they would need. The government and the railways had all the resources necessary. The callous treatment of the immigrants wasn’t because the government didn’t have any money. They were spending millions on building railways. Graft was rife. To make matters worse the government, unless they were completely incompetent, knew that the immigrants were highly vulnerable. Many Icelanders didn’t speak English. They didn’t understand the Canadian legal system. They were dealing with corporations that cheated them on prices while providing poor equipment and food. All this could have been remedied by providing someone to represent them in business matters. We often talk about the hardship of our pioneer ancestors but hardship can often be alleviated and alleviated at minimal cost. The hardship of the immigrants was, in large part, caused by dishonesty, corruption and callousness. Immigrants were seen as an opportunity for exploitation. I’d add racism for many times I’ve heard about how Icelanders were not treated as equals by the British population in Winnipeg. Most people know the story of the Falcons and their struggle to be treated as equals in hockey. Or Icelanders killed at work sites simply being dismissed as Icelanders rather than as individuals. Except, if you read Barry Broadfoot, you discover that even though the government preferred English, Irish and Scots settlers, they didn’t treat them any better. The immigration brochure at the top of this article makes no bones about how British subjects were preferred. Yet, the clerks and bakers and bookbinders from London, England who believed the propaganda about the glories of Canada and found themselves in sod huts on the prairies, miles from help and support, faced with trying to clear and break land, received less help than the Icelanders. The casualties were high. Suicide was common. Disease widespread. Despair everywhere. And the agents that hung around the train terminals were no more honest with the English settlers than the Icelandic. Many cheated and stole at every opportunity. Some decisions made by the government were just acts of gross stupidity. When people emigrated, they needed mutual support, they needed neighbours nearby. They couldn’t get that on 160 acres. The breaking of the land into quarter sections and, to make matters worse, often making intervening sections unavailable, isolated the settlers, deprived them of family, friends and community. How smart do you have to be to say this is not in the best interest of the settlers? We should organize the land in ways that made it easier for people to support each other. Instead, the land was divided up in a way that would maximize profit for the railways and the government. However, the politicians and powerful businessmen, particularly those on the railways, weren’t interested in the welfare of the settlers, the Icelandic ones, the English ones, the German ones, none of them. Fortunes were being made by people closely connected with the power brokers in Ottawa. Your people and mine were cannon fodder. That they survived and, finally, prospered, is a miracle that needs to be recorded, honored, remembered. When I look at old newspapers and magazines from Winnipeg and see advertisements for Icelandic businesses, I am amazed. The fishermen and farmers carved a living out of forest and lake and the Icelandic businessmen elbowed their way onto the streets of Winnipeg and made a living in a hostile environment. To deny the callousness, the corruption, the exploitation, the dishonesty that existed is to take away credit from our people. Putting food on the table, establishing a business, getting an education, making a place in society wasn’t made easy. It wasn’t just the land and the weather that our people had to overcome. But people like my great grandfather, coming to Canada with nothing, created a dairy, bought a farm, partnered in a general store. I don’t think the establishment reached out a helping hand. For that, he needed the Icelandic community. This entry was posted in Uncategorized and tagged emigration, gimli, government, Icelandic, immigration, manitoba, new iceland, railways, treatment, Winnipeg by william. Bookmark the permalink. Thank you Bill for telling us about this other less known side of their story. I recommend also a TV-documentary film by Baldur Hermannsson “Þjóð í hlekkjum hugarfarsins” (see e.g. http://www.ruv.is). There Baldur (historian) describes in very strong language the cruel treatment of the poor in Iceland by the upper-class and local authorities. No wonder that these exploited and mistreated people tried to leave Iceland for the promised land.